I want to be able to retrieve our data as it has family pictures and a lot of other valuable data stored on it. When I check both disks with the DriveDx application they pass all tests, however I still can't seem to mount them. If the filesystem on the NAS HDs is Btrfs, no luck with macOS. There is no Btrfs filesystem "driver" for macOS available. You can then only try to mount the drives on a system capable of reading Btrfs (another Syno NAS/Linux box etc.). I want to be able to retrieve our data as it has family pictures etc. and a lot of other valuable data stored on it. You won't be able to mount the individual drives because Synology employed (as a default) a technology called SHR (Synology Hybrid RAID). So, to recover anything, you will need another Synology unit. Short of having a second Synology unit, your data should have been backed up. SHR is an automated RAID management system that makes storage volume deployment easier than traditional RAID systems. SHR will allow users to handle RAID management, expand storage, and maximize storage capability even if they do not have a fine grasp of various RAID levels. SHR allows for 1-disk or 2-disk worth of redundancy - meaning the SHR volume can suffer up to two disks lost, and the data volume will still be available for use. Note that a RAID volume (either Classic RAID or SHR) is not a backup system. Even if using "classic" RAID, you still woudln't be able to mount the individual drives; they would be need to be mounted as the entire array (and this is before you get to the filesystem). It can't be said enough that RAID is not a backup. It's a fault tolerant device, not a disaster recovery device. My suggestion is to obtain a similar Synology unit (secondhand via eBay is fine), rebuild the array then archive them to a USB drive. Do you know anyone with a Synology NAS you can drop the drives into to recover the files? Synology claims you can add drives from another NAS setup and it should be able to recognize them. That would be the easiest way, if the drives themselves are fine. Pull the data onto another backup system, then reformat the drives for macOS and keep using them as a static backup or Time Machine. Fair warning though, if you do this, you need an enclosure that has a fan... I've had drives in fanless enclosures die after long usage for backups. I downloaded the UFS Explorer RAID Recovery software, connected both disks and exported the data. Not the answer you're looking for? 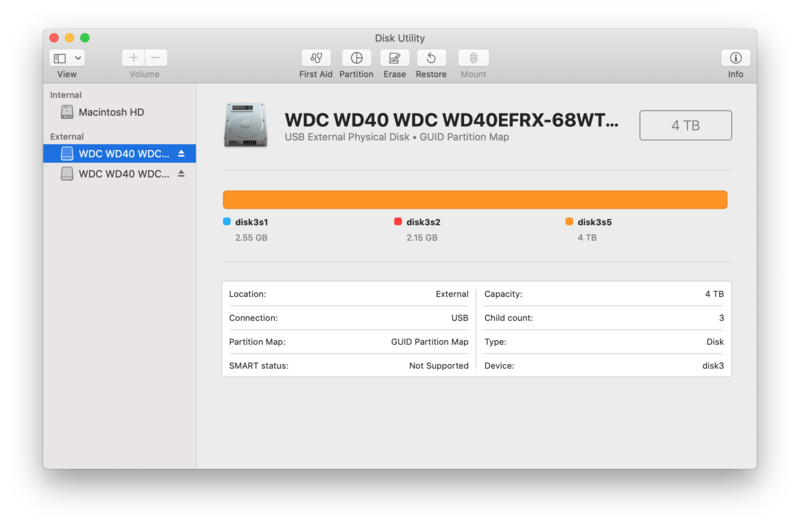 Browse other questions tagged hard-drive disk-utility external-disk nas . external hard disk was vanished after updating Mavericks OS!